So, I was laying awake last night, when I started to dream. Well yes.. I know… I was awake. While it could be considered mildly irritating, it is equally gratifying when people ask about ‘The next one’ when ever they read you novel. The expectation of a sequel to something you wrote as a stand alone is odd to the writer. Well at least it is to me. Cider Lane has a beginning middle and end. A very definite end at that for all I left some things open to the readers imagination. The simple truth of which is I don’t like endings that tie up everything and leave nothing to the readers own mind. The simplest truth is I did not have a sequel planned, and did not expect to write one. Even though i am as aware as anyone that readers like to have the ‘next one’ and series tend to do better than stand alone books for the same reason. That reason been I am not the only one who does not like endings. Instead I have several unrelated projects I am working on already. The Passing Place a fantasy novel about half written which I started before cider lane and keep going back to. The Wells of Time a dark steam punk novel of a twisted present. Maybes Daughter, a lighter steam punk romance written as much for humour as anything else. With that in mind do I really think I should consider a sequel to a stand alone novel which has yet to prove to be entirely successful after all, for all it is getting good reviews. Well in all honesty up till last night no. Not least because I really did not have any story of any kind to work with anyway. 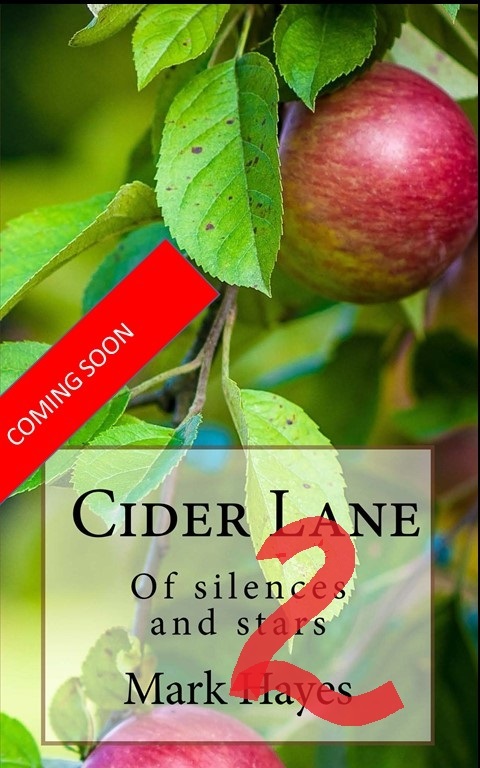 Cider Lane was not written with a sequel in mind. Or indeed even considered. But then I lay awake in the night and ideas started tossing around in my head and when I finally drifted off to sleep I had a half formed plan. When I woke I scribbled notes furiously on the back of the most convenient piece of paper I could find which happened to be a cig packet. Smoking kills , but the packets are damn convenient when you need to scribble down some notes. And so now I have a bunch of plot notes revolving around several characters from the first novel, the story of which is new and separate but carries the lives of other characters forwards. Its neat and clever and lets me pick up a couple of years after the first novel and tell more of my story. The point, if I have one in this post, is that now i have had the idea I almost need to start writing it. it’s like craving a cig, or any other drug, and while i may finish other things first, I am still compelled to start. So for all those who have been asking ……………..